After a tension-filled tour and a life-threatening motorcycle accident, Bob Dylan famously holed up in his Big Pink home near Woodstock, New York in 1967. There, with his backing group The Band—then known as The Hawks—he recorded over 100 songs, officially releasing the final, 24-song product in 1975. The album, The Basement Tapes, would go on to be considered one of Dylan’s best works, a wholly compelling if messy document of rustic American music. Now, 47 years later, unused lyrics from those sessions have fallen in the hands of producer T Bone Burnett (Inside Llewyn Davis, True Detective). With approval from Dylan himself, Burnett curated a folk-rock supergroup to re-imagine those sketches in a hubristically titled package, Lost On The River: The New Basement Tapes. 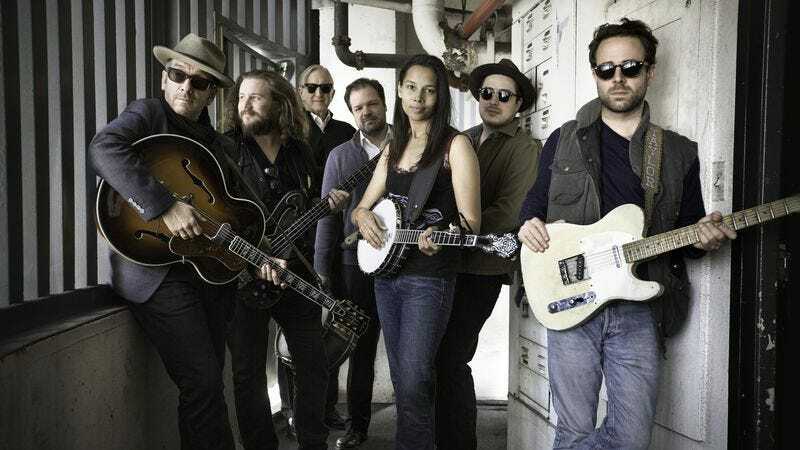 Enlisting Elvis Costello, Marcus Mumford (Mumford & Sons), Jim James (My Morning Jacket), Rhiannon Giddens (Carolina Chocolate Drops), and Taylor Goldsmith (Dawes) under the moniker The New Basement Tapes, the all-star cast recorded more than 50 reworkings of Dylan songs over a two-week session at Capitol Studios in Hollywood. Though it’s certainly not as mythical an origin story, it’s a fascinating publicity pitch considering the marquee talent involved. While this ad hoc lineup appeals to fans of modern, radio-ready Americana, the New Basement Tapes also work because its members have already proved their Dylan bonafides. Costello covered “You’re Gonna Make Me Lonesome When You Go” on his 2004 Kojak Variety reissue, while Mumford performed with Dylan at the 2011 Grammys and has played renditions of his Love And Theft cut “I Was Young When I Left Home.” James also covered the Basement Tapes cut “Goin’ To Acapulco” for the 2007 biopic I’m Not There, while Goldsmith’s band toured with the iconic singer-songwriter in 2013. Like Wilco and Billy Bragg’s Mermaid Avenue sessions, which took on Woody Guthrie lyrics, and Old Crow Medicine Show’s “Wagon Wheel,” a career-making single adapted from unused Dylan demo, The New Basement Tapes packages old material in a simultaneously contemporary and reverent way. Released in both 15-track standard and 20-track deluxe formats, the album boasts Burnett’s uniformly pristine and twangy production, giving each artist time in the spotlight. There are flashes of excellence in jams like the ripping “Quick Like A Flash” and Goldsmith’s wistful, acoustic-based “Diamond Ring,” though unfortunately both only appear as bonus offerings. Even actor and guitar-slinging vagabond Johnny Depp shows up on “Kansas City” to play background electric while the album’s other surprise cameo, the Haim sisters, provide subtle backing vocals. Other times, songs like “Nothin’ To It” and “Hidee Hidee Ho #11” suffer from almost gratingly inoffensive compositions that often result from supergroup collaborations. The songs on The New Basement Tapes, while collaborative, feel more like B-sides from each respective player’s personal discographies. The sauntering, bluesy “Married To My Hack” is a dead ringer for some of Costello’s latter work while “Stranger” could’ve been on any Mumford & Sons LP. These similarities are truly effective on the twangy, James-led opener “Down On The Bottom,” an offering that could rival any My Morning Jacket track. Giddens, arguably the least known member of the collective, makes a strong showing on the old-timey “Duncan And Jimmy,” showcasing the bucolic, Appalachian string music of her band. The original Basement Tapes have endured not just because of the quality of the songwriting but because of the freewheeling and charmingly ramshackle nature of its recording. 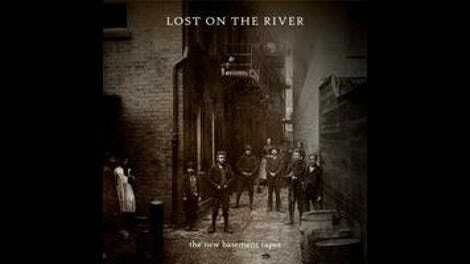 However, The New Basement Tapes is a mostly pleasant collection of sleek and sometimes forgettable tunes. With the extensive and long-awaited The Basement Tapes Complete: The Bootleg Series Vol. 11 finally hitting stores in November, it’s hard to think of this release as anything more than enjoyable but inessential listening.